As previously announced, the 3rd Annual RIDE FOR RONNIE Motorcycle Ride and Concert, benefiting the Ronnie James Dio Stand Up and Shout Cancer Fund, will take place on Sunday, May 7, 2017. Riders will assemble for a continental breakfast at Harley-Davidson of Glendale with kickstands up at 11AM. The RIDE will take them through the streets of Los Angeles County to Los Encinos Park in Encino, where they will be treated to an afternoon of live music, raffle and live auction, food trucks and more. Last year’s RIDE FOR RONNIE event raised over $50,000 for the cancer charity. 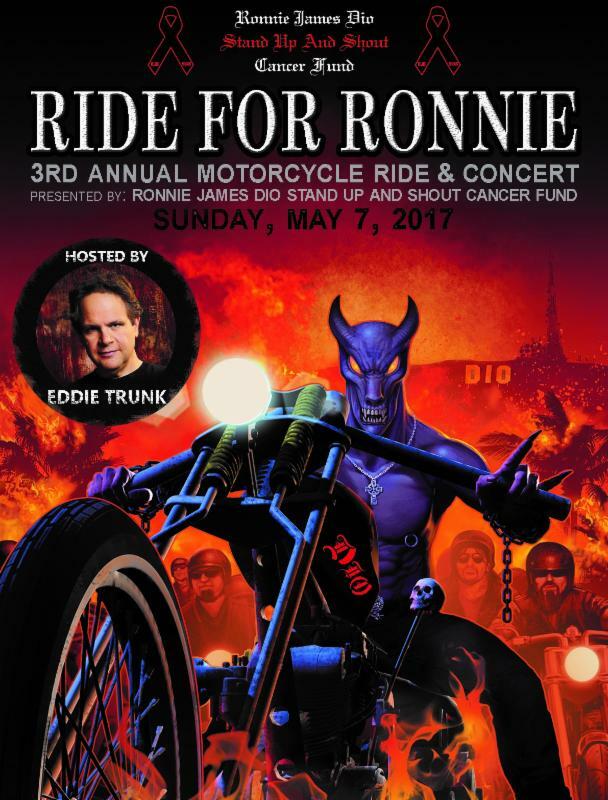 The Dio Cancer Fund is pleased to announce that after being unable to host last year’s RIDE due to scheduling conflicts, renowned radio personality EDDIE TRUNK (http://eddietrunk.com/ ) will return to host 2017’s RIDE FOR RONNIE. In an exclusive interview with Billboard, Trunk explains that he was first invited by Wendy Dio to host Ronnie James Dio’s memorial service in 2010, and since then has donated his time to host several subsequent events in support of the Ronnie James Dio Stand Up and Shout Cancer Fund’s quest in cancer research. 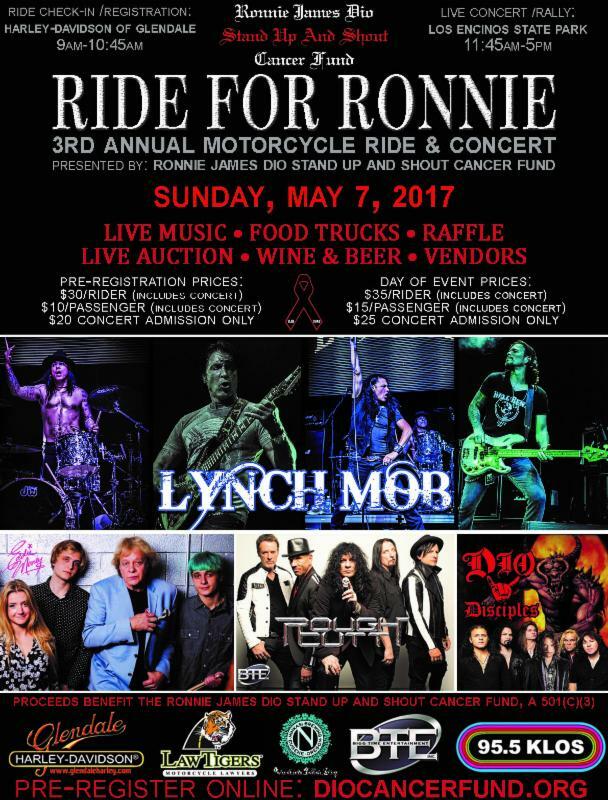 This year’s RIDE FOR RONNIE will include performances by rockers LYNCH MOB (http://georgelynch.com/wordpress/), EDDIE MONEY (www.eddiemoney.com), ROUGH CUTT (www.roughcutt.com), DIO DISCIPLES (http://www.facebook.com/DioDisciples), THE LOVELESS (https://www.facebook.com/theloveless666), SONIA HARLEY (http://soniaharleymediamu.wixsite.com/soniaharleyrocks), and NO SMALL CHILDREN (http://nosmallchildren.com). A silent auction will be conducted at one of the exhibit booths throughout the afternoon, while live auctions, featuring one-of-a-kind rock collectibles, will be held during intervals between artist performances. Food trucks will be on site throughout the day. Those participating include Slammin’ Sliders, G’s Taco Spot, Greenz on Wheelz and Archie’s Ice Cream. Sponsors lending their continued support to the RIDE FOR RONNIE are Harley-Davidson of Glendale, Law Tigers and Ninkasi Brewing Company. New sponsors to the event this year include Bigg Time Entertainment and LA’s rock radio station, 95.5 KLOS. The Ronnie James Dio Stand Up and Shout Cancer Fund (www.diocancerfund.org) was formed in memory of the legendary rock singer Ronnie James Dio, who lost his life to gastric cancer in 2010. A privately funded 501(c)(3) public charity, the Ronnie James Dio Stand Up and Shout Cancer Fund has already raised well over $1 million since its inception. Monies raised have been committed to the cancer research work of the T. J. Martell Foundation for Cancer, AIDS and Leukemia Research, the gastric cancer research unit of the M.D. Anderson Cancer Center in Houston, where Ronnie was treated for gastric cancer during the last six months of his life, and other cancer research projects. Most recently, the Dio Cancer Fund has committed funds to support the research of Dr. David Wong and his team at the UCLA School of Dentistry in developing a simple, non-invasive saliva test for the early detection of cancer, which is in keeping with the Fund’s mission of cancer prevention, research and education.